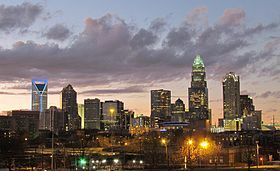 The Charlotte-Concord-Gastonia Metropolitan Area, commonly referred to as the Charlotte Metro Area or the Queen City, encompasses seven counties in North Carolina and three in South Carolina. The Charlotte MSA is the largest in the Carolinas, the fifth largest metropolitan area in the Southeastern region, and the 23rd largest metro area in the United States. The city of Charlotte itself is the 16th largest city in the country, and the 2nd largest city in the Southeast. Other principal cities in the Metro area include Concord and Gastonia NC and Rock Hill SC. Charlotte has gained fame as the second largest banking and finance center in the country, and the area's orientation towards emerging industries is seen in the success of the University Research Park (the 7th largest research park in the country) and the redevelopment of a new biotech research facility along with several prominent NC Universities. Home to the NFL’s Carolina Panthers, NBA’s Charlotte Bobcats, and many NASCAR teams. The number one most entrepreneurial city and best place for companies to thrive. Emphasizes international business and currently has 951 internationally based firms in the region that represent 45+ nationalities and employ over 68,000 workers. Holds records for the largest population of first ancestor records in 2004-2005 for all of the following: Scottish, Zairian, Zimbabwean, Sub-Saharan African, Sierra Leonean, Liberian, Somalian, Arab, Ethiopian, New Zealander, and Estonian. The number one best urban school district. The second most desirable place to live and purchase a home which means that more people are coming to the area and staying than there are leaving. A popular destination for those relocating from other parts of the world, particularly popular with coming from India, East Asia, Southeast Asia, Mexico and other Latin-Caribbean countries, West Africa, Central Asia, the Arab World, and Europe. Charlotte is paired with eight sister cities around the world. Their first sister city relationship was established with Arequipa, Peru in 1962. Charlotte Douglas International Airport is the sixth busiest airport in the world as measured by traffic. Flights are available to Canada, Central America, the Caribbean, Europe, Mexico, and South America. According to 2012 Census estimates, the greater Charlotte area has residents from 158 different countries, speaking 175 different languages. Entrepreneurial advantages, well priced living costs, global connectedness, education, and technology are attractive pulls that have greatly impacted the growth of Charlotte over the past several decades. The changing face of the area presents new challenges and great opportunity for existing and new churches in the proclamation of the gospel within geographic pockets and among people groups. The Charlotte CSA has 23 different geographic pockets where the un-evangelized population is 71% or greater. These geographic pockets represent an estimated un-evangelized population of more than 115,715 households from all three major socio-economic groups. Eleven of these pockets are within the top 15 highest prioritized in the state. Along with this, Charlotte is home to at least one hundred different people groups from around the world with an estimated foreign-born population between 350,000 and 450,000. Only is 47.97% of Charlotte’s population is affiliated with a religious congregation and only half of that number are affiliated with an evangelical congregation. Many of the existing evangelical churches are declining and in need of revitalization. There is a great need for many new churches to be planted in the city. International House - A grassroots non-profit organization with a mission to promote international understanding and to serve immigrants in need. They offer foreign-language conversation hours, cultural events, an international book club, citizen diplomacy programs, an international women’s group, language classes, free citizenship workshops, and legal services for low-income immigrants. Ethnic Clubs and Organizations - Link to an extensive list of ethnic clubs and organizations in the Charlotte area.